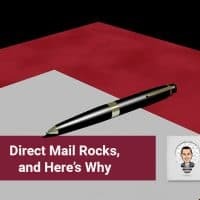 Today we’re talking all about Direct Mail Marketing, and why you should be doing it in your business. When it comes to direct mail, and really any type of real estate marketing, the first priority should always be to secure more listings. Finding buyers is a nice byproduct of your marketing efforts, but shouldn’t be the main focus of your marketing investment. Direct Mail is maybe the most cost effective way of scaling your marketing efforts. Typical postcard postage price is between 26-49 cents, and for a complete solution it’s 77 cents per piece (that’s printed, and out the door). To set yourself up for success, first you have to get a very targeted list. A good example of this are absentee owners. Probate is another good place to start looking at a targeted mailing list. To find out where we’re acquiring this data, head over to our blog post all about things you need to get started with Direct Mail. 1. A simple Call To Action – the CTA should be to call you so that you can begin a dialoge with the prospective seller about how you can help them. 3. Your mailings should be the first step in a Direct Mail Funnel – leading a prospective seller through a series of activities, information, and trust steps along the way from a cold lead to a warm seller. A good response rate you should expect are between 3-5%. How you handle these return inquiries is the next key step. To get the best response rates it’s important to keep sending these campaigns multiple times (we recommend 4 mailings per prospect). Having a systematic approach to keeping the campaigns consistently rolling over time will gain trust from prospective sellers and getting them to pick up the phone. If a professional real estate investor only buys the best deals, how many other listings could you as a real estate agent get from direct mail activities? This could be a great places for real estate agents to fit into the market of direct mail advertising. Aside from absentee owners and probate, For Sale By Owner lists can be very fruitful. 80% of FSBO listings will eventually list with Realtors, so you want to be the first realtor they think of when they have to list. Cancelled and expired listings are also a great group to send direct mail campaigns to. Whichever group you select to start with, pick one group that you feel you can speak to and connect with best, and focus just that demographic. Don’t try to be a generalist at direct mail, focus down on one type of seller group. If you’re looking for a way to create a marketing plan around your listings check out our Attract and Retain bootcamp will help you get a great marketing plan in place for your listings.